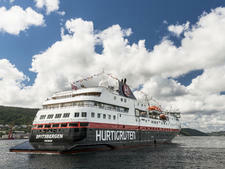 Hurtigruten (meaning "fast route" in Norwegian) began life in 1893 as a scheduled means of transportation between cities, towns and islands along a 1,500-mile coastline between Bergen in the south and Kirkenes some 240 miles above the Arctic Circle. Today the line continues to offer the same coastal itineraries, as well as expedition cruises in the Arctic and Antarctic. 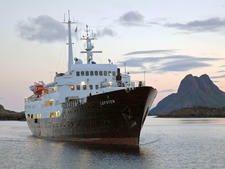 The line also offers cruises in and around Greenland, Iceland and the northern most parts of Russia and is one of the few that offers Northwest Passage itineraries. Hurtigruten ships provide a comfy home whether exploring the rugged shores of Greenland, keeping an eye out for ice floes in the Arctic, passing the charming towns of Norway's coast or braving the choppy waters of the Drake Passage for an adventure in Antarctica. The cabins, while simply furnished, are comfortable, and the atmosphere is casual. The ships lack many of the trappings emblematic of cruising: casinos, organized activities, entertainment, multiple dining choices, etc. 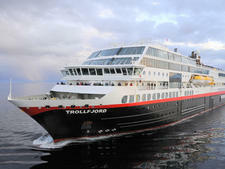 but these attractions are not what people choosing a Hurtigruten cruise are looking for. In Hurtigruten's own words, Mother Nature provides the entertainment, and interaction with fellow travelers and spectacular scenery are the main draws. Onboard activities are limited. On expedition cruises crewmembers give lectures based on their academic specialties: local flora, fauna, history and culture. On coastal voyages, you might find the occasional music group invited onboard, but for those going north enough to cross the Arctic Circle, the Arctic Circle crossing ceremony can be a rousing show for those chosen by King Neptune as victims (ice water initiation) and others watching. The passenger mix varies depending on whether you're on an expedition cruise or coastal voyage. On the latter, you'll find lots of Norwegians who are mostly aboard to travel point-to-point. On expedition cruises you'll find Norwegians, as well as a mix of Europeans with a large number of Germans in particular. Antarctica cruises tend to attract more North Americans. Most are well traveled and sophisticated, yet unpretentious individuals who are content to enjoy the spectacular scenery and picturesque communities. Many will be able to speak decent English. The average passenger age is around 50, with families few and far between, except on coastal sailings. 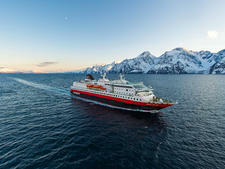 Hurtigruten's fleet can be divided into two types: coastal voyage ships and explorer ships. The coastal voyage ships carry freight and vehicles, as well as passengers, and time in port varies, ranging from a half hour (or less) in most small towns up to a few hours in major population centers. The northbound and southbound itineraries are not identical, so a port visited during the night on the northbound route might be visited more conveniently during the day going southbound. 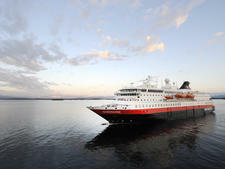 Hurtigruten also operates four explorer vessels as base-camps-at-sea: MS Fram, MS Midnatsol, MS Spitsbergen, and beginning in 2019, the first-of-its-kind, hybrid electric-powered MS Roald Amundsen will join the fleet.